The overhead budget estimates the coming year’s total overhead costs and sets an overhead allocation rate. To prepare it, you need detailed information about the company’s overhead, including an analysis of fixed and variable components of the overhead. Overhead consists of the costs of making products above and beyond direct materials and direct labor. Accountants allocate overhead to products by spreading overhead costs out over all of the units produced, like peanut butter on sandwiches. Then, for each product, multiply the overhead allocation rate by the direct labor hours required. Don’t confuse the overhead allocation rate with variable overhead per unit or per direct labor hour. Variable overhead per unit is used to compute variable cost per unit when calculating contribution margin. Variable overhead per direct labor hour is used in theory of constraints. 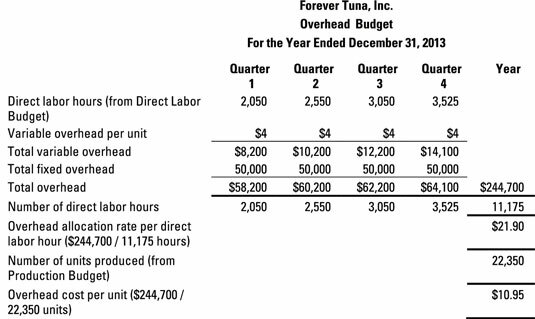 For the earlier Forever Tuna example, assume that the company has variable overhead equal to $5 per direct labor hour. The company must pay an additional $200,000 per year in fixed overhead. Use the number of direct labor hours computed in the direct labor budget to estimate total variable costs. Then add in fixed costs of $50,000 per quarter ($200,000 divided by four quarters).